The Weisman Art Museum collaborated with neuroscientists at the University of Minnesota and Ricardo Martinez Murillo, a neuroscientist in Spain, to produce the traveling Beautiful Brain exhibit featuring the drawings of Santiago Ramón y Cajal. Cajal is considered the father of modern neuroscience and is famous for his detailed drawings of neurons and structures in the brain. We saw the exhibit in Minneapolis. I was struck by the resemblance between this drawing of a neuron and the roots of a tree. 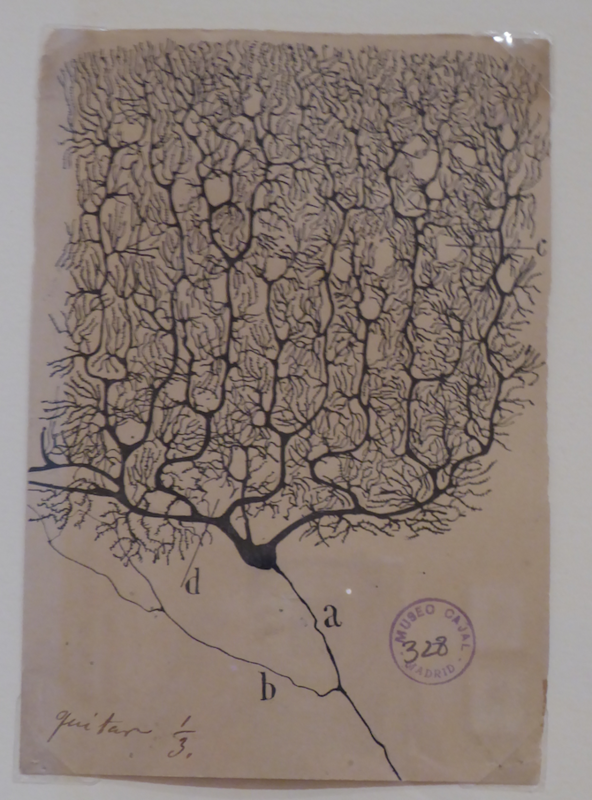 A drawing of a neuron by Santiago Ramón y Cajal - from the Beautiful Brain exhibit. In the exhibit, Cajal's wonderful drawings are presented together with modern visualizations of brain cells and structures. We were happy to contribute by making a structure collection with receptor proteins from brain cells. 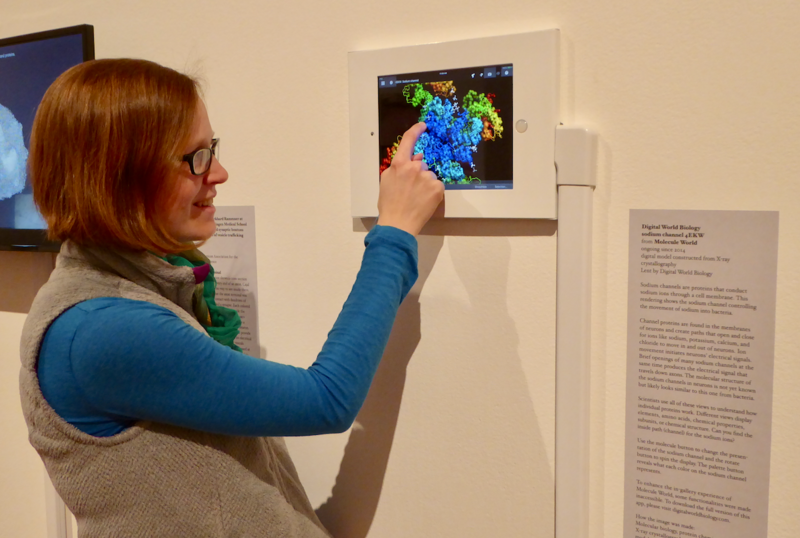 A museum visitor explores brain proteins in Molecule World. Whether or not you attend the exhibit, you can still explore the Beautiful Brain structure collection, from an iPhone or iPad using Molecule World. If you have Molecule World on an iPhone, touch the links for individual structures to download them and open them in the app. If you have Molecule World on an iPad, you can download the entire collection at once by touching the link that ends in "mwc". Go to the Beautiful Brain Collection. You'll find a sodium channel, potassium channels from rat and bacteria, and an amino acid receptor. 1. Where is the membrane-spanning region? Change the drawing mode to Spacefill and the coloring style to Charge. Use the Show/Hide menu to show all atoms. Use the color key to identify where the protein has a neutral charge. 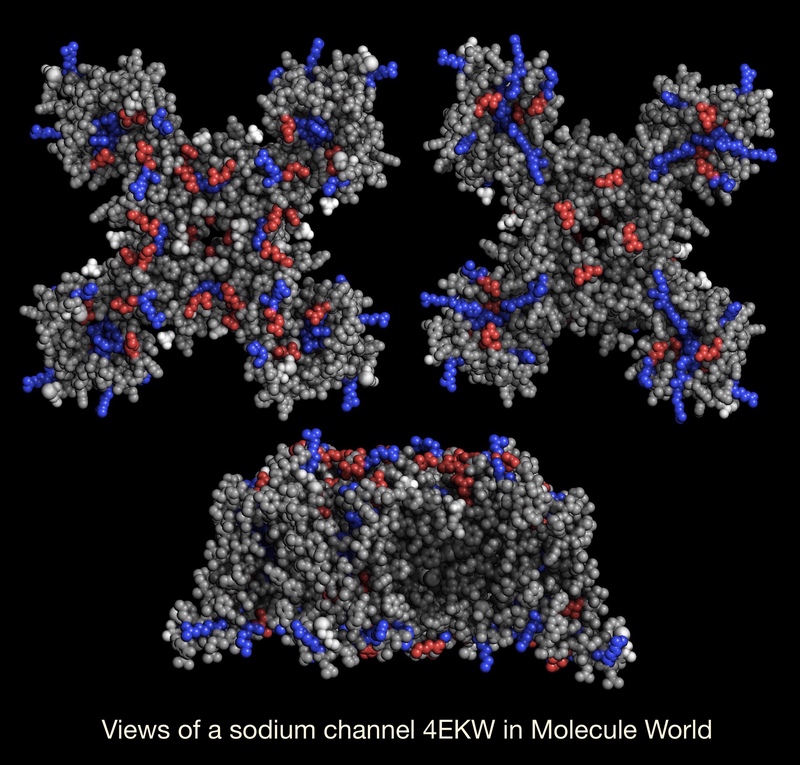 A sodium channel from the Beautiful Brain structure collection colored by charge. The top views show the channel from outside and inside the cell, respectively. The bottom view is from the side and shows the transmembrane region. 2. What charge do you see for amino acids near the opening of the channel? What is a likely charge for the ion that goes through the channel? In the image above, in the top left, the channel opening is in the middle of the protein. Using the Molecule World color key shows how the four amino acids near the opening are charged. 3. What unusual amino acid is found in this protein? Open the sequence viewer, then find and touch an X. Hide everything else and zoom in. Use the color key to identify the element. Two amino acids are known to contain this kind of element. Can you figure out which amino acid this is? 4. What type of secondary structure is found in the membrane spanning region? Touch the Secondary View button and use the color key to identify the type(s) of secondary structure found in this protein. Color by charge to see where this protein spans the membrane. 1. Where does the potassium pass through this channel? Color these proteins by element. Use the color key to identify the potassium. 2. In what ways are the rat and bacterial potassium channels similar (or different)? Use the Secondary View to identify types of secondary structure. Color by charge to identify the membrane-spanning regions. Color by molecule to identify the number of subunits. Where is the membrane-spanning region of this protein? Change the drawing style to space fill and color by charge. Use the color key to identify the part of the protein with a neutral charge.